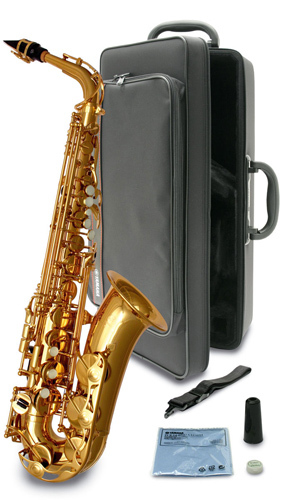 The Yamaha YAS-280 beginner Sax offers a perfect introduction to the world of the saxophone. Whether a student beginner, or an advanced player needing a doubling instrument, the 280 series saxes offer surprisingly high quality features at a student model price. This is the top selling student/intermediate sax in the world. Made to the highest standards the 280 still outperforms everything around it. The design of the crook is based on the Professional 62 model to give a flexible, responsive tone. We were really impressed with the YAS-280 in our recordings as it had impeccable tuning and a free blowing sound that is unparalleled at this price range. New beginners will find this sax easy to play and produce a secure tone on, advancing players will enjoy the quality tone and positive action. We professionally set-up each YAS280 in our Workshops to our Platinum standard ensuring perfect blowing and action. "I have always recommended Yamaha YAS280 saxophones to pupils as the consistency in build quality and performance, both tonally and in intonation, have always been unmatched against other beginner instruments." Paul Nathaniel - Sax Player with Ronnie Scotts Jazz Band, London Symphony Orchestra, Sax Tutor at Wellington College. Supplied with backpack style hard case. Includes Yamaha 4C beginner Alto Sax mouthpiece. Fully workshop checked and with a 2 year warranty. Supplied on a 14 Day Home Trial. My lodger has just bought this and looking at it you can see how well made it is. He is a complete novice and it played well straight from the case. To have a pull through and reed included was a bonus. He is very pleased with his purchase. I'm very pleased with it. Definitely improvements over my old sax. It's excellent as far as I can tell but I am a complete beginner (at the sax) so the notes are not sounding great as yet.